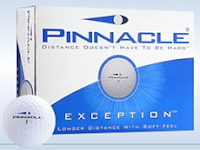 Hurry and get 2 FREE Pinnacle Exception Golf Balls! Just fill out the form. Allow 3-6 weeks for delivery. This would make a great stocking stuffer for any Golf enthusiasts!